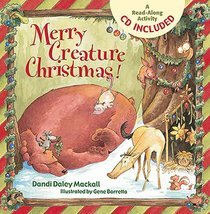 Another whimsical tale from Dandi Daley Mackall and illustrated by Gene Barretta will have children celebrating Christmas with the creatures of the forest. When Christmastime comes around, it seems even the animals find a way to offer praise and honor to the birth of Jesus. Although the older, wiser animals are afraid to invite Big Bear to join in the festivities, Star, the young colt, isn't quite as timid. Big Bear surprises them all as he leaps from his sleep to exclaim, "Merry Creature Christmas!" A delightful story for children of all ages, "Merry Creature Christmas" reminds readers of the reason to celebrate the holiday season. About "Merry Creature Christmas! (With Cd)"